Experience the only escorted service of the Papal Audience. Thousands of pilgrims from around the globe gather every Wednesday to see Pope Francis and now you have the chance too! For your Papal Audience experience, we’ll provide headsets, a competent and informed guide, and a thorough explanation of what you will experience during the Papal Audience. Your guide will request your invitations, pick them up, and bring them to you. Your guide also gets you inside early to ensure the best possible chance of finding good seats and will stay with you until the Pope begins his address. You'll be provided with headsets and guided to the location where the Papal Audience will be held: either St. Peter’s Square or the Sala of Paul VI. 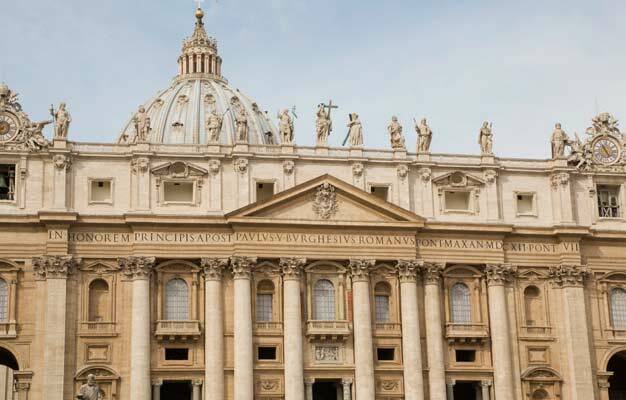 Once inside, your guide will explain the origin of the Papacy from the first Christians through Constantine’s era and up to the current wonder of the Vatican City. Your informed guide will provide a detailed explanation of the events of the Papal Audience and prepare you for your gathering with Pope Francis. Experience the awe and wonder which occurs at the Papal Audience as Cardinals preach in various languages and reach out to pilgrims and visitors from the far reaches of the world. The tour starts in Piazza Pio XII, facing St. Peters Basilica on the left-hand side at the corner next to the newspaper stand. Please be there 15 minutes before your tour starts. The tour ends at St. Peter's Square. The tour lasts 4 hours and 15 minutes. The tour is operated in English, French, or German.